For many middle-aged women, weight is one of the top health concerns. Extra weight can be caused by menopause, or simply by aging and losing muscle mass. Young women may struggle with their weight as well for a number of reasons. 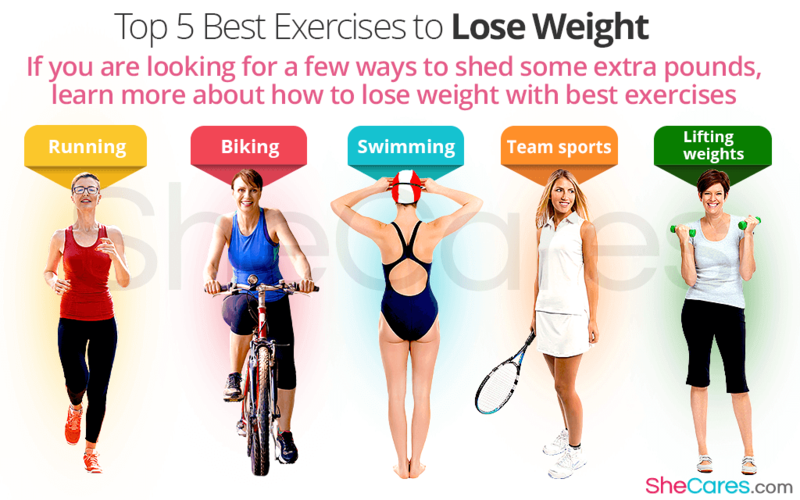 If you are looking for a few ways to shed some extra pounds, read all about the best exercises to lose weight. We lose weight when the calories we burn exceed the calories we consume. In other words, we eat less calories than it takes to perform our daily activities. In most cases, the best and healthiest way to lose weight is to focus on both diet and physical activity. By both reducing the number of calories consumed as well as increasing the calories burned by working out, you will be able to begin to lose weight. One of the simplest forms of exercise, running is also one of the most effective for weight loss. When you run, your entire body works together to keep you moving quickly, which burns more calories than most other exercises. It can be tough on joints, however, so you should always exercise caution with running. Some treadmills may have options to soften the impact to protect joints. Involving less impact than running, biking is an exercise that can help you lose weight without hurting most of your joints, although it can still cause problems for some people's knees. Be sure to bike over 10 miles per hour for maximum benefits. Laps are a great way to get your vigorous exercise without putting too much stress on your joints. Although it requires access to a pool, it is a remarkably effective exercise if done with the proper intensity. Nearly all competitive sports require extreme amounts of physical activity that can help you burn calories and shed pounds. Even single sports, like tennis, can be excellent for weight loss. While many people think that strength training has little to do with losing weight, building muscle mass is actually crucial to losing weight. Weight lifting or any strength training - including exercises like push-ups and other body weight exercises - are excellent for weight loss. However, strength training alone will not burn many calories, and it should be incorporated with cardio exercises like the ones listed earlier. Keep in mind that other exercises - especially other vigorous cardio - can be substituted for any of these best weight loss exercises, but it should be vigorous enough to substantially raise your heartbeat. Learn more about losing weight with the best diet for weight loss.